SUMMARY. TiBrazeAl-665, which is a low-temperature filler metal for brazing titanium, titanium matrix composites, and titanium to copper, is offered in the form of foil 50 ± 5 microns (0.002 inch) thick. Liquidus temperature is 645°C (1193°F). Solidus temperature is 607°C (1125°F). Shear strength of titanium Grade 2 brazed joints is up to 97 MPa (14 ksi) at room temperature. Shear strength of titanium Grade 5 (Ti-6Al-4V) brazed joints is up to 110 MPa (16 ksi) at room temperature. Shear strength of titanium-to-copper brazed joints is up to 77 MPa (11.2 ksi) at room temperature. Typical applications are: heat exchangers, medical instruments, cooling system, electronic housings, lining and electrodes of galvanic baths, and others. The width of TiBrazeAl-665 foil is 6 inches (~150 mm). 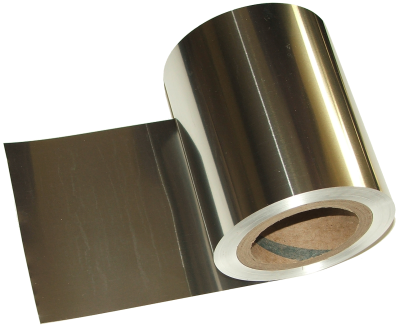 The foil is supplied in the form of 1-5 lbs rolls. 1 lb of the foil covers about 33806 cm2 (5239 in2 ). SUMMARY. TiBrazeAl-655, which is a low-temperature filler metal for brazing titanium, titanium matrix composites, and titanium to copper, is offered in the form of wire 1/16 inch (1.6 mm) in diameter. Liquidus temperature is 643°C (1190°F). Solidus temperature is 502°C (1010°F). Shear strength of titanium Grade 2 brazed joints is up to 131 MPa (19 ksi) at room temperature. Shear strength of titanium Grade 5 (Ti-6Al-4V) brazed joints is up to 143 MPa (20.7 ksi) at room temperature. Typical applications are: titanium tubes, titanium to copper tubes, medical instruments, cooling system, electronic housings, lining and electrodes of galvanic baths, and others. 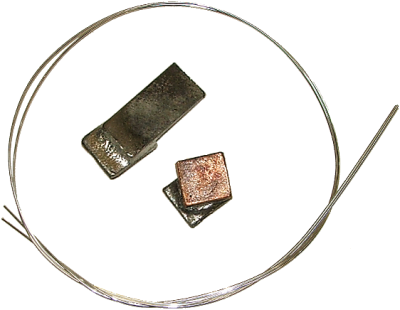 The wire is supplied in the form of 36" (91 cm) pieces. 1 lb of the TiBrazeAl-655 wire comprises of 94 pieces, 36" each piece.